Authors: Camps-Fariña, A., Beckman, J.E., Font, J., Borlaff, A., Zaragoza-Cardiel, J., & Amram, P.
When massive stars die, they explode as supernovae. These explosions are so powerful they can outshine the billions of stars in an entire galaxy. Supernovae can be used to measure distances in cosmology. The same supernova can even be observed multiple times when its host galaxy is gravitationally lensed. These explosions can also wreak havoc on their neighborhood, blasting gas out of their host galaxies, preventing further star formation. Supernova feedback is invoked in simulations of galaxy evolution to reproduce realistic galaxies. These simulations must make assumptions about how supernova are distributed in the galaxy. Supernovae which are more clustered will have a different impact on their galaxy than supernovae which are more spread out. Since supernova explosions are transient and rare, it’s challenging to study how they cluster in real time. One strategy is to look for their fossils: supernova remnants. Remnants are expanding bubbles of gas swept up by the explosion. The authors of today’s paper found three concentric expanding bubbles of gas around a massive star cluster in the Triangulum Galaxy. To identify expanding bubbles, you need to know the velocity of the gas. The authors targeted the Hα emission line, which traces the gas ionized by massive stars. Using a technique called Fabry-Perot spectroscopy, the authors obtained a spectral cube, with two spatial dimensions and one velocity dimension, of the Hα emission towards the star cluster. Each pixel of this spectral cube contains a spectrum of the ionized gas towards that pixel. The spectrum encodes the distribution of velocities in the ionized gas. Figure 1 shows the spectrum of a pixel. A simple expanding bubble will cause a pair of peaks in the spectrum offset from the average velocity by the expansion velocity of the bubble. The approaching side of the bubble will have a negative velocity compared to the galaxy, while the receding side will have a greater velocity. The authors fitted Gaussian functions to the spectrum of each pixel, searching for pairs of peaks offset by the same velocity on either side of the main peak. Figure 1. 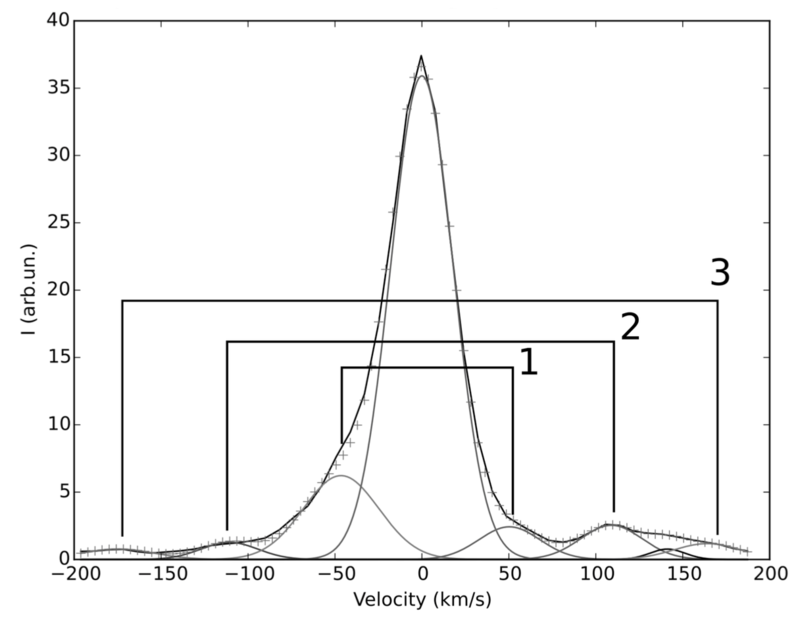 Ionized gas spectrum of one pixel with multiple velocity components. The crosses show the observed spectrum. The three pairs of Gaussians (solid lines) represent the approaching and receding parts of each expanding bubble. The middle Gaussian is the main component of ionized gas. Spectra in every pixel are searched for such symmetric pairs of Gaussians. The authors found three pairs of peaks towards the star cluster, each with a different expansion velocity. Figure 2 shows the pixels where each pair of peaks was detected. The pair of peaks with the lowest velocity show the largest spatial extent, just what you’d expect for expanding bubbles that are slowing over time. Figure 2. Maps of the three expanding bubbles detected towards the star cluster, corresponding to the three pairs of peaks in the spectrum in Figure 1. Each pixel is color coded by the bubble’s expansion velocity at that location. The expansion velocity of the bubbles decreases as size increases, just as a bubble should slow as it expands into surrounding gas. Contours outline where H-alpha emission has constant brightness, increasing to smaller contours. Are the bubbles generated by supernova remnants or some other process? When low mass stars (like our Sun) die, they eject their outer layers, becoming a supernova’s gentler cousin: a planetary nebula. Before massive stars go supernova, they emit lots of ultraviolet photons, which ionize the gas around them. This ionized gas has a higher pressure than the surroundings, so it expands outward, forming an HII region. HII regions and planetary nebulae also look like expanding bubbles of ionized gas, so they can masquerade as supernova remnants. In supernova remnants, the gas is ionized by the shockwave from the explosion, while HII region and planetary nebulae are ionized by energetic photons from their central stars. This difference in ionization mechanism results in different emission line strengths. Emission from ionized sulfur, called [S II], discriminates between shock ionization (from supernovae) and ionization from photons (HII regions and planetary nebulae). Figure 3 shows that the bubbles emit strongly in [S II], in agreement with other observations of supernova remnants. Figure 3. 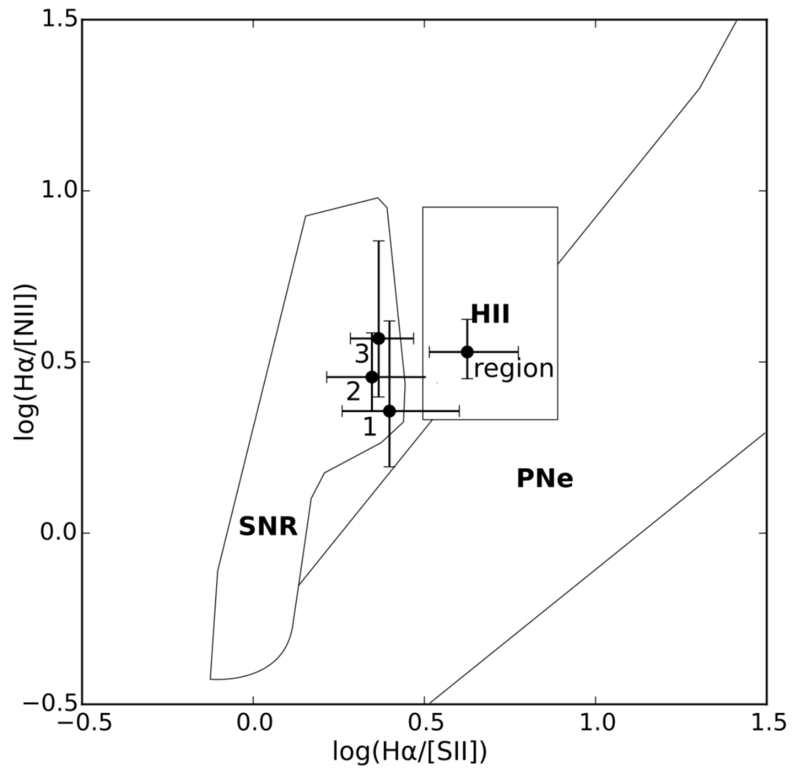 Measurements of emission lines from ionized nitrogen ([N II]), sulfur ([S II]) and hydrogen (Hα) from the bubbles, compared to supernova remnants (SNR), HII regions, and planetary nebulae (PNe). The three bubbles (1, 2, 3) have emission lines consistent with other supernova remnants. The HII region ionized by this star cluster is also plotted. Since the three bubbles are concentric and centered at the same point, the three supernova must have originated in the same massive star cluster that exists today. Using the expansion velocity and size of each bubble, the authors worked out how long each bubble has been expanding and thus how long ago each supernova exploded. The ages are 20, 40, and 100 thousand years. These supernovae are simultaneous from the perspective of galaxy simulations, which only calculate time steps of millions of years. This trio of supernova remnants, nested within each other like Matryoshka dolls, cannot be expanding into a simple uniform medium. If the surrounding gas had a constant density, the first supernova remnant would have collected all of this gas and driven it away from the cluster leaving no gas for the subsequent expanding bubbles. The interior of the first supernova remnant must have been replenished with gas somehow. This means that the surrounding medium does not have a uniform density. In fact, we know that gas in galaxies is clumpy, not smooth, and organized into structures like giant molecular clouds. As the first supernova remnant expands it dissolves nearby molecular clouds, which replenish the excavated bubble with gas. The subsequent supernovae push concentric bubbles into this recycled gas. The clumpy surroundings of supernovae allow multiple rapid-fire explosions to have an additive effect on the galaxy, which must be taken into account in simulations. Supernova feedback is an important element of all modern galaxy evolution models. It’s necessary to reduce the efficiency of star formation to realistic levels. But in order to make simulations more realistic, supernova feedback must be modeled after observations. These observations show that multiple supernovae can explode from the same cluster (almost) simultaneously. The impact of supernovae on a clumpy gaseous medium can both slow the expansion of bubbles and quickly replenish the bubble interiors. Simulations can no longer assume that single supernovae explode into a smooth medium when gas reaches some critical density. Fascinating article, thanks for posting Jesse. The three explosions seems extraordinarily close to each other both in space and time which might suggest a planetary nebula origin from a single star rather than a supernovae one from 3 different stars? If they genuinely were three different supernovae then the masses of each of the progenitors must’ve be almost exactly the same mass, though perhaps the earlier explosions triggered the later ones? You guys should look at my reblogs of your posts. I am picking up much more of your text than you advance for the reblog, and, really, you should be doing it if you want your reblogs to be read.